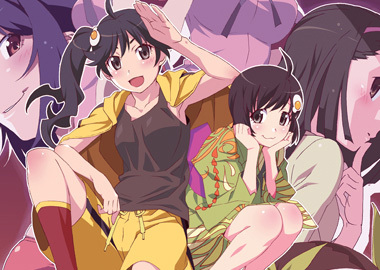 Out of all the volumes of this series (including Bakemonogatari) this one is the shortest running at only four episodes long. Even though it's only four episodes you do get a very brilliant set of episodes that can be watched repeditly until the disc turns into dust although I wouldn't recommend snorting that dust as if it was a line of cocaine as it would probably kill you. This volume has an episode that seems to be a cult classic among the anime fan base and the reason why is because of a very infamous scene where Koyomi is brushing his sisters teeth leaving them both feeling very orgasmic about it. Yes this does have very heavy incestuous tones but it is also a very funny scene that when seen you can't help but to talk about it. 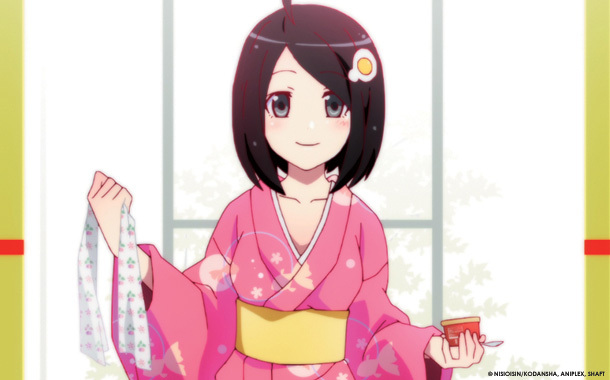 The characters are really lovable minus one character named Yotsugi that always ends her sentences with "I said it with a posed look" and it gets really annoying especially since they are trying to force feed this catchphrase down our throats but other than that I don't have anything negative to say about the characters. I posted this review with a posed look...a posed look of annoyance. Artwork is very colorful and detailed with some very abstract backgrounds that feel like something out of a high-class museum. Characters are designed really well and look very cute but it does overdo it with the whole cuteness thing in the opening credits. 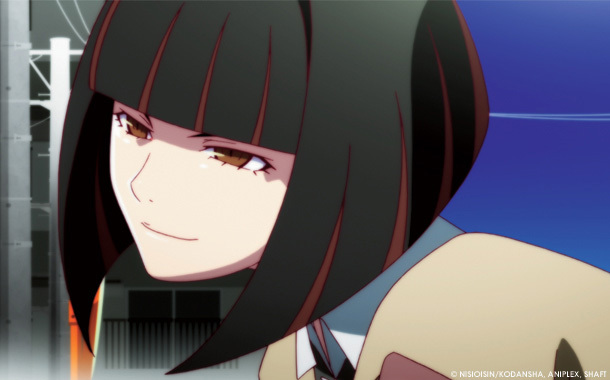 Animation is pretty smooth with nothing to complain about. Japanese dub is really great but it can get annoying at times especially with them repeating all their catchphrases every episode like "I said it with a posed look" and "I don't know everything. I only know what I know" as they feel very forced making me feel very unconformable. The soundtrack is pretty good too with a nice mixture of Rock and Pop. She may be pretty however looks can be deceiving. 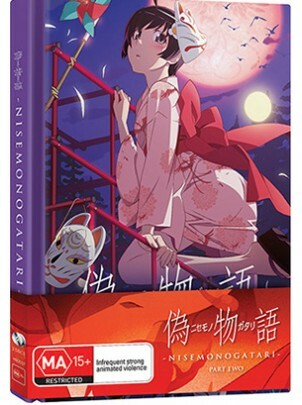 Some pretty standard but also very nice array of special features in this set that include all the opening and closing sequences that appeared in Nisemonogatari and a bunch of television ads and some promotional adverts for the Japanese DVD and Blu-Ray releases. Much like the releases in the past for this series we are greeted with an awesome hardback book that shows off some pretty radical artwork and character profiles. Overall this release was much better than the previous volume and a great ending to this season of the show. Although there are some annoyances that stop this volume from being perfect. Really excellent viewing this one is. Genre: Animation/Anime, Lo-Fi Horror/Supernatural, Comedy, Drama, Action. Good review retro, I pretty much agree with everything you said. 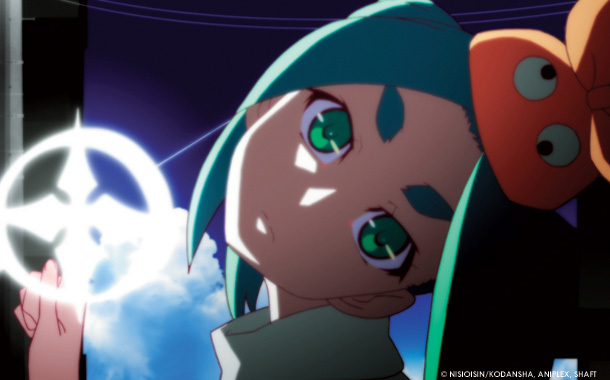 I am interested to hear your thoughts on Nekomonogatari when you get it. I'm very much looking forward to reviewing that.